"JACK JABLONSKI / AFTER THE HIT"
"MARY KATE GOES TO STATE"
A hit during a high school hockey game on December 30, 2011 sent Jack Jablonski into the boards. In that instant, Jablonski’s spinal cord was damaged and he slid to the ice, paralyzed. His life was forever changed, as were the lives of his parents and friends, his coaches and teammates. Support poured in from all over the country, with frequent visits from friends, teammates and professional athletes. Communities hosted fund-raisers. His CaringBridge website has had almost 1.1 million visitors. Hockey parents demanded the sport be made safer. As a result the Minnesota State High School League enacted new rules and penalties for malicious hits. Jablonski stayed upbeat through the entire ordeal and transitioned into the new normal of his life. Jack still doesn't see himself as disabled. At 17, he can't help but believe that technology and medical breakthroughs will fix it all someday. 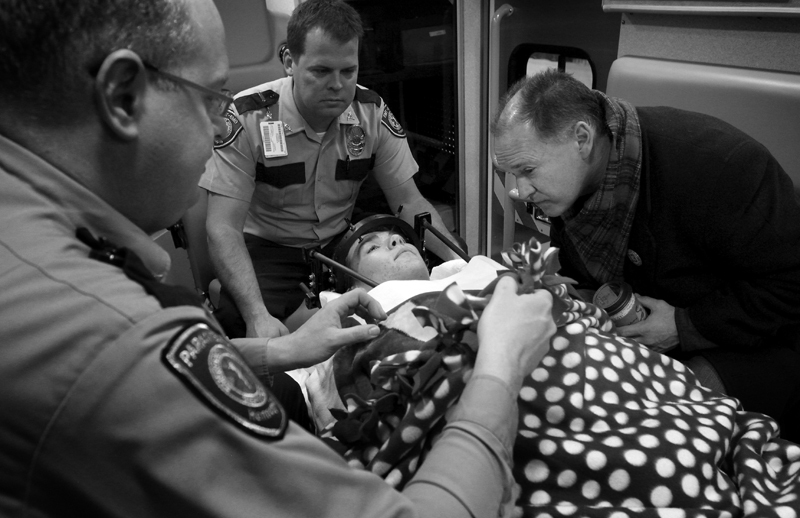 January 23, 2012 - Jack Jablonski, 16, along with his father Mike rode in an ambulance with paramedics as he was transferred from Hennepin County Medical Center (HCMC) to the Sister Kenny Rehabilitation Institute in Minneapolis, MN. The same paramedics where the ones who initially transferred Jablonski to HCMC from the rink after his injury and requested to be the ones that transferred him from the hospital to the rehab center almost a month later.